The climate change battle easily conjures up comparisons with the 1950s space race. Mankind needs to exert much greater and speedier efforts to achieve results. That’s why it’s no coincidence that President Barack Obama has breathed life into on a $400 million program modeled on the space race. Details of the program, called the Advanced Research Projects Agency-Energy (ARPA-E), were announced during the Major Economies Climate Forum (which we reported on here and here). Turns out that ARPA-E has been around for two years already, but only really took off last February, when it received $400 million from the economic stimulus package. ARPA-E will develop more risky, new energy technologies to cure Americans of their oil dependency and signals “a significant shift for the Department of Energy (DOE), both for the research it conducts and how it conducts that research”, according to the House Science Committee’s description of the agency. Companies and people who come up with eight-page “concept papers” could be awarded grants by the Department of Energy (DOE). Projects that reduce greenhouse gas emissions and improve energy efficiency could be offered awards of $500,000 to $20 million by the DOE. ARPA-E is modeled after the Defense Advanced Research Projects Agency (DARPA) which was launched two years ago to and is funded to the tune of $400 million. Concept papers are required to briefly outline the technical concept and participants should be prepared for intense interaction with ARPA-E officials if they sign Technology Investment Agreements. Timing is of the essence, as concept papers can be submitted to DOE from May 12 through June 2. The US is not alone in assigning galactic importance to the climate change battle. E3G, a European think tank promoting the acceleration of the global transition to sustainable development, released a report recently calling for global R&D investment in clean energy equivalent to that of the space race era. The report, Innovation and Technology Transfer: Framework for a Global Climate Deal stresses that current approaches to low carbon innovation and deployment are not adequate to meet the climate change challenge. E3G says that $15-20 billion more funds are needed every year over the next 10-15 years in global research to achieve climate security. 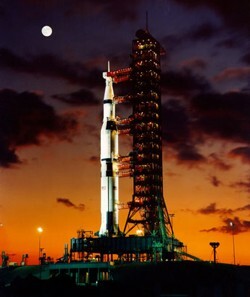 That is similar to the investment the US made annually at the peak of the Apollo Program to get mankind to the moon.